Today, Isabel had her 18 month shots... Ok, shot. Just one. And she is 19 months... Yes, I have been putting it off because I swear it hurts me more than it hurts her. I can not stand the idea of pinning her down to a table while someone sticks a needle into her, no matter if it is for her own good or not. But she is a trooper. Tears came, but a Dora sticker (on her shirt in the photo), Elmo, sweet potato fries and a good nap made everything all better. I, of course, was still feeling sorry for her, so I wanted to do something extra special today. I thought about the science museum or the pool, but a nap seemed like a much greater need. So, what does any good Southern woman do to make someone feel better? I cook. I saw this idea on Pinterest once and it has stuck in my mind. I took an ice cube tray and filled it with all her favorite things. I have also seen this done on a paint palette and in other containers, but I had to make do. 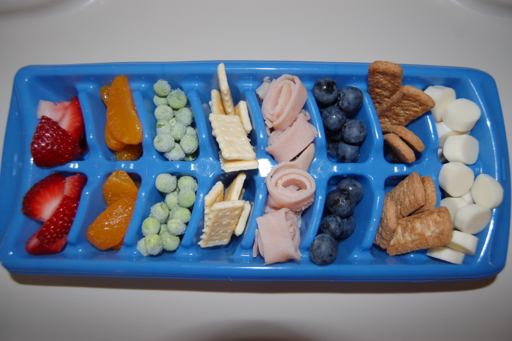 Strawberries, mandarin oranges, frozen peas, mini club crackers, turkey, blueberries, Earth's Best organic honey sticks, and mozzarella string cheese. Will definitely play with this idea and try variations. 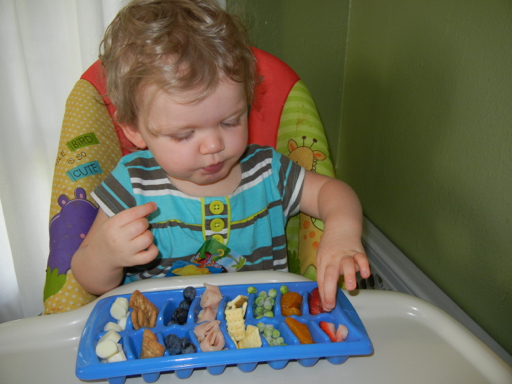 This would be a great way to introduce new foods or to get a picky eater to eat.